A Barney Carriage House Wedding Photographer is able to take pictures of incredible New England scenes. The venue is one of the top choices for couples who wed in the Massachusetts area. The bride and groom pictured above chose this space and it did not disappoint. As their Barney Carriage House Wedding Photographer I knew how to make the most the amazing venue and the grounds that surround it. This photo of the newlyweds was taken with me standing outside the house and the couple in an upstairs room. Doing this gives the impression that the bride and groom are truly sharing a private moment and it made for more candid photographs. The lighting in this picture gives it a magical, romantic ambiance. At the heart of the image the bride and groom stand in a room on the top floor of the house, framed perfectly by the window and elegant curtains. An off camera spotlight draws attention to the image of the two, and give them a glow. The radiance of room makes it appear that the couple is the reason for the brightness that surrounds them, as if their love is actually illuminating the space that they occupy. The outside of the house adds character to the image. 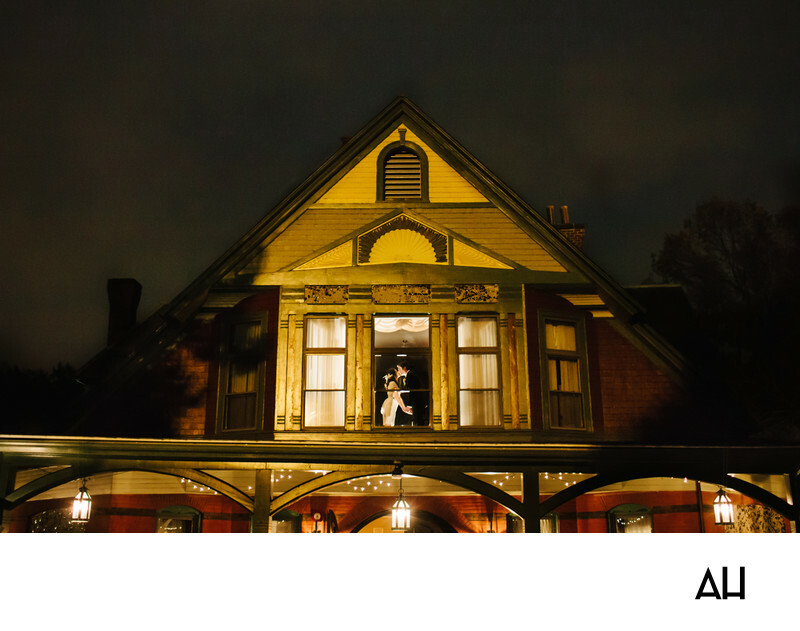 The wooden siding of the house is seen in detail under the glowing light, and the porch beneath the window that holds the portrait of the couple is utterly charming. Lanterns hang from the roof of the porch, shining in the dark evening atmosphere. The photo is enchanting, and the bride and groom make could be a final scene from a classic Hollywood film, with the boy and girl finding their happily ever after with one another in this moment.